Monrovia, Liberia - H.E. 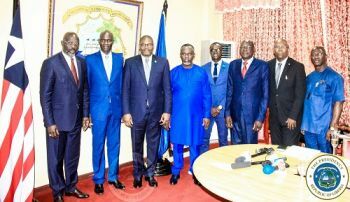 President Dr. George Manneh Weah today, January 24, 2019 received Letters of Credence from ambassadors representing six countries from three continents—Africa, Europe and Asia. It is the first time the Liberian leader received such a huge number of ambassadors in a single day since his ascendency a year ago.